Before we get to tuning let me share with you a little information about banjos. The banjo was originally brought to North America by captives on slave ships. After the banjo’s arrival on these shores it spread throughout the southeastern states and was taken up by the white settlers in the Appalachian region. Local banjo styles and techniques developed and were handed down from person to person over many generations. 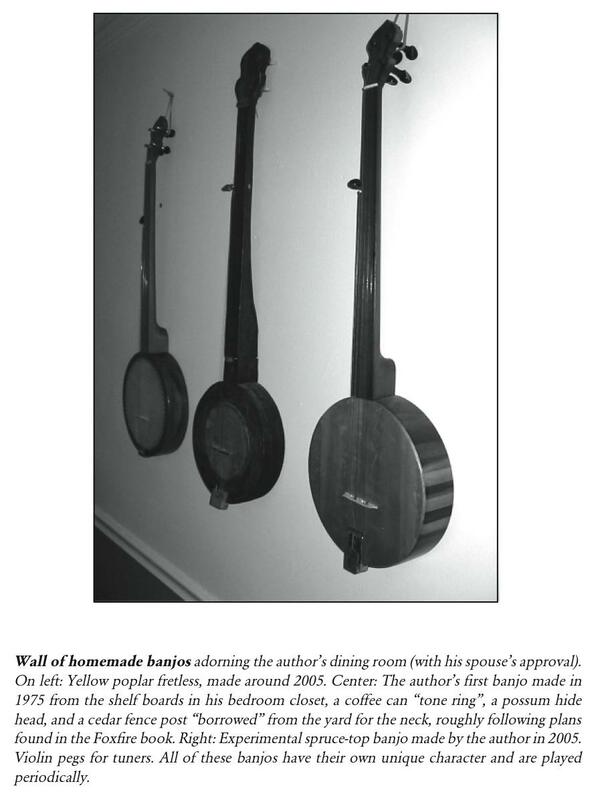 Early banjos in Appalachia were generally simple handmade instruments. A ground hog hide would likely serve as the drum head on the characteristic round body. Wooden parts would be carved from local hardwoods, pegs whittled and fitted to the headstock, and strings might be stretched “gut” or, if available, modern steel strings might have been used. Frets, which are little metal bars set into the neck to create precise stops on the fingerboard for producing various notes of the scale, were not commonly found on traditional early American banjos. As commercial banjos became more widely available during the mid to late 1800’s fretted banjos became more common. The unique placement of the short 5th string, with it’s tuning peg protruding from the side of the neck, is usually played as a “drone” string, merrily contributing to the rhythmic tones of the banjo. The banjo and fiddle, playing together, became the standard dance music in Appalachia with both instruments complementing each other, tonally, melodically and rhythmically. The clawhammer banjo style is sometimes called “frailing” and probably gets it name from the claw-like shape of the right hand during playing. The notes are produced by a rapid series of downstrokes of the right index or middle fingernail interspersed with plucking by the outstretched thumb–also in a downward motion. Local variations of the style persist to this day and, as you study clawhammer banjo, you will discover some of the variations of this overall theme that have developed. These lessons will not go into that level of detail but, rather, are designed to teach you the essential basics of clawhammer style banjo playing. Clawhammer banjo picking differs significantly in sound and technique from the flashier “Scruggs Style” banjo picking used by bluegrass musicians since the late 1930’s. Earl Scruggs (and others) put metal fingerpicks on their right hand and use a plastic thumbpick to create a louder, brighter banjo sound. The fingers of a bluegrass banjo player’s right hand pick upwards and the thumb picks downward. In clawhammer, all strokes are in a downward direction. The clawhammer banjo style sounds good alone or with a group. It can also be used to provide basic chord and rhythm accompaniment for singing. Old-time music “jam sessions” abound (once you find them) and even the bluegrass pickers don’t frown too heavily on clawhammer players joining their circles. Many bluegrass banjo players also play “a little clawhammer” and you’ll find friends in both camps. 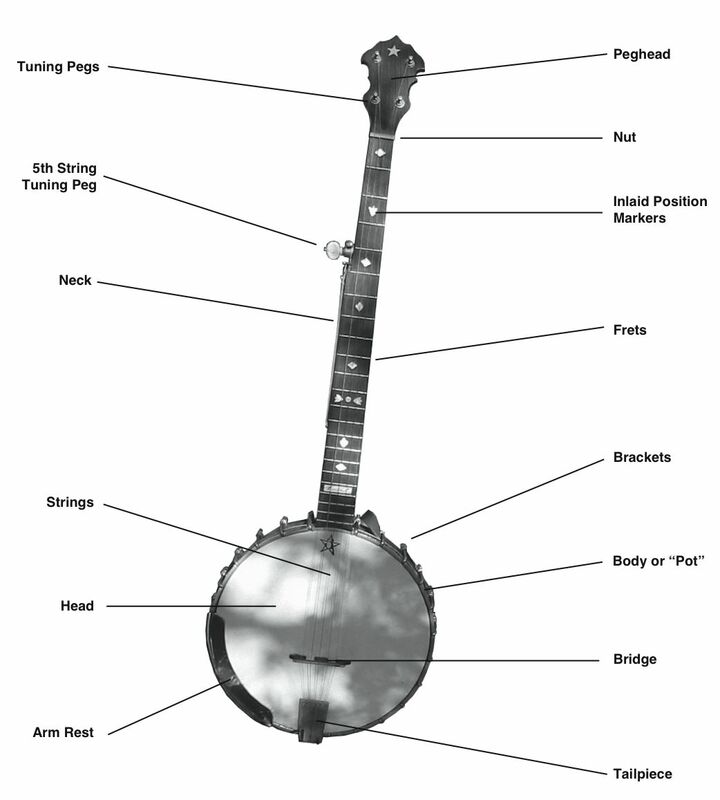 Before we talk about tuning, please take a look at this illustration showing the parts of the banjo. Yours might be a little different but if you know these terms it will be easier for us to communicate.